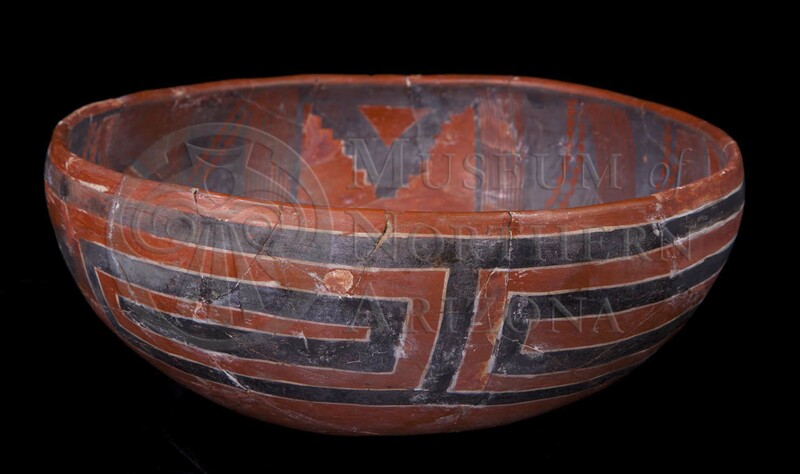 Fourmile Polychrome bowl from the Museum of Northern Arizona collections. Click the image to open the Fourmile Polychrome gallery. Fourmile Polychrome is a type of White Mountain Red Ware concentrated east of the Sierra Ancha in an area that can be defined on the west by Cherry Creek, on the east by the White River, on the south by the Salt River, and on the north, just below the Little Colorado River. Within this area, the focal point of production appears to have been below the Mogollon Rim, and it is notable that this pottery type has only been reported in Arizona. Core Color: Gray, sometimes slight pink tint. Temper: Small angular fragments (sherds) of nearly uniform size, grayish in reduced, yellowish or tan in the oxidized portions; occasionally red or black fragments; grains of quartz sand are fairly frequent; temper inconspicuous in cross-section when core light colored; conspicuous when the core is a dark color; temper occasionally conspicuous on worn surfaces. Surface Finish: Heavily slipped and fairly well polished; often powdery, occasionally crazed; both surfaces of bowls slipped, only jar exteriors slipped. Surface Color: Maroon red to dark brown, sometimes almost black, in heavily over-fired specimens; core and surface color generally contrast. Forms: Bowls, pitchers, jars, and effigy jars. Paint: Black glaze and flat white; black paint dull, lustrous, sometimes vitreous, sometimes gritty permanent; white paint, soft and chalky, frequently fugitive. Pigments: Dark, combination lead, copper and manganese; white presumably kaolin. Design: Free and bold; geometric and occasionally conventional life forms; decoration of bowls, black stripe 6 to 12 mm wide just below the rim, bordered by marrow white line on lower side only, occasionally no other interior decoration, usually undecorated band is decorated zone covering entire central part of the interior, includes hatching in triangular, rectangular and curved panels framed with wide black lines or black stripes outlined with narrow white lines, sometimes ticked in white; also solid black stepped areas and stripes, outlined in white; horizontal or diagonal white lines occasionally with black dots superimposed, occasionally massed white areas; sometimes staggered lines; rims usually plain, rarely painted with white stripe with black ticks or dots superimposed; exterior-confined to band beginning immediately below the rim, band 35 to 80 mm wide, framed by black stripes, upper stripe outlined in white on lower side only; lower stripe outlined in white on both sides; decoration within band mostly white horizontal and diagonal narrow or wide lines, white open stepped elements , frets, “centiform” elements; sometimes black dots superimposed on white lines; sometimes solid black triangles and stepped elements outlined in white; small jars-rims are sometimes painted white and embellished with simple black patterns; main body of jar treated with triangles, stepped figures and frets in black and white over a red background. Comparisons: Cedar Creek Polychrome, Kiet Siel Polychrome, and Showlow Polychrome. Cedar Creek Polychrome often incorporated Pinedale style designs; Showlow Polychrome uses large fields of white slip; Fourmile Polychrome jars typically have double (sometimes single) banding lines on the exteriors and framing lines are usually twice the size of hatching lines. Other Names: Redware; Three-color glaze and painted ware; White-bordered-black-on-red; Chevelon Ware; Showlow Polychrome; Willow Mountain Polychrome. Colton, Harold S., and Lyndon L. Hargrave. (1937) Handbook of Northern Arizona Pottery Wares, Museum of Northern Arizona Bulletin 11, Flagstaff, Arizona. Haury, Emil W. (1934) The Canyon Creek Ruin and the Cliff Dwellings of Sierra Ancha. Gila Pueblo Medallion Papers, No. XIV. Globe, Arizona.